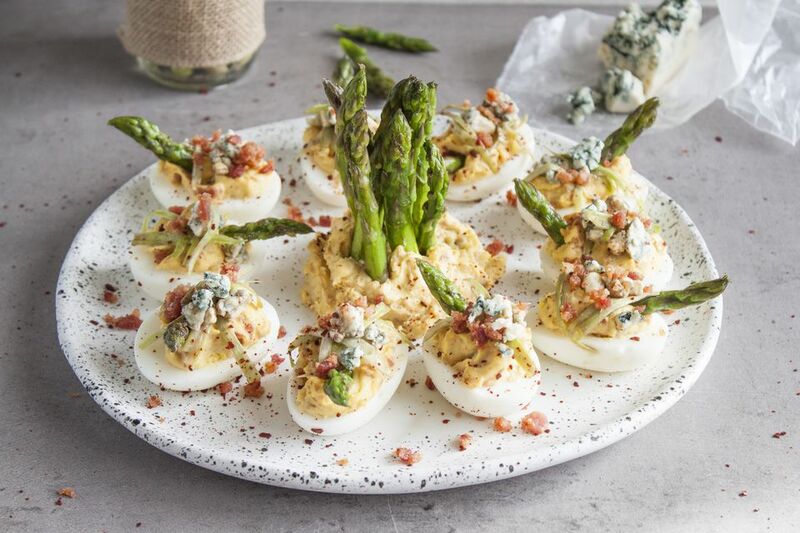 Deviled eggs with bacon, roasted garlic, blue cheese, and asparagus are an elegant and modern take on the traditional appetizer from the Old World. The beautiful presentation is sure to meet with your guests' genuine approval. In this version, the bacon bits are folded into the creamy egg yolk and roasted garlic filling and add both flavor and texture. A micro salad made of fresh asparagus shavings tossed with olive oil and balsamic vinegar provides the perfect backdrop to the crumbled blue cheese garnish on top of the eggs. Start by preheating your oven to 350 F. Next, cut off the top 1/5 of the garlic heads, exposing all the cloves. Place them onto a sheet of aluminum foil, drizzle with olive oil, and wrap them well. Place the wrapped heads onto a baking sheet, place in the oven, and roast for 40 minutes. While the garlic is roasting, arrange the bacon on a parchment-lined baking sheet and then place into the refrigerator until the garlic is finished. Once the garlic has been roasting for 40 minutes, place the bacon in the oven and cook until it begins to get crispy (about 15 to 20 minutes). If the garlic has already softened considerably (check by squeezing the aluminum foil packet with tongs), take it out before the bacon is completely done. Otherwise, remove both the garlic heads and bacon from the oven once the bacon looks done. Unwrap the aluminum foil using tongs and let the garlic cool off before handling. Place the cooked bacon over paper towels to absorb the fat and let it cool off. While the garlic is roasting (initial 40 minutes), place all the eggs in a pot of cold water. Bring to roaring boil and cook for 8 minutes. Remove the pot from the heat and let the eggs sit in the hot water for another 4 to 5 minutes. Transfer the pot to the sink and run cold water over the eggs. Once the eggs have cooled off enough to be comfortable to the touch, begin peeling them, discarding the shells. Do not let eggs get completely cold, as it will be much harder to peel them. While the bacon, garlic, and peeled eggs are cooling off, turn your attention to the asparagus. Cut off the tough bottom ends, about 1/4 of the length of each stalk, from the bottom. Using a potato peeler, peel the top layer of the asparagus stems. Discard the peels. Working in two batches, sear the asparagus (including the stalks you shaved off parts from). Place 1 tablespoon of cooking oil in a large pan over medium-high heat, add half of the asparagus stalks and lightly season with salt and pepper. When slightly blistered, remove and place them onto a paper towel to cool off. Repeat with the second half of the asparagus. This step should take about 10 minutes. In a food processor, pulse the cooled bacon slices until crumbled. Remove and set aside. Carefully slice each cooled off boiled egg in half, lengthwise. Gently remove the yolk and place in the food processor and set the whites onto a platter. To the eggs yolks, add the sour cream, mayonnaise, mustard, roasted garlic (simply squeeze out the cloves by applying pressure with your fingers), olive oil, and salt and pepper. Process until you have a smooth mixture. Reserve 2 tablespoons from the crumbled bacon and fold in the rest into the yolk mixture. Using a small spoon, fill the egg white halves with the yolk and bacon mixture and arrange on a platter. You will have some mixture left over, which you can place in the center platter to use as a base to arrange the long asparagus spear tips garnish (in an upright position). This is of course optional. Drain and dry the asparagus shavings. Toss them in 1 teaspoon olive oil and 1 teaspoon balsamic and place a few shavings on top of each deviled egg. Garnish each egg with one of the reserved 18 asparagus tips and sprinkle with blue cheese crumbles. Finally, sprinkle bacon bits and (optional) Korean chili powder over the eggs. Serve.